A Self Help Motivational Call to Action! Self Help Motivational Call to Action – Your Choice! The self help motivational advice on this page is all about practical ways in which you can begin to shift your experience of reality into one that you say you prefer. Just like any shift of experience into any other reflection of reality this will be achieved by changing your vibration to match the vibration of a different parallel reality. Of course, as always, this is achieved through your beliefs, emotions, thoughts and behavior - aka your state of being. I've noticed that many people seem to believe that, oh well, if others are in the process of making changes in my world, I can simply sit back, relax and not take part in any of that, to let others do the work so to speak. However, what many people fail to realize is that as a physical expression of spirit, inspired physical action is necessary in order for real physical change to occur in physicality. That is to say, your inspired action is necessary for you to shift to a parallel reality reflection of earth that's preferred by you - this has nothing to do with anyone else! Self Help Motivational Call to Action - Plastic Convenience? Let's start by highlighting a self help motivational tip on plastic. Where I live in Thailand, amazingly on every corner there is either a 7-11, Family Mart or Tesco-Lotus Express - so-called convenience shop. If they were a real convenience shop then they would have bathroom facilities as they do in Japan, but that's another story. The point I want to make here is about the amount of mostly unnecessary plastic that these shops give away to their customers on a daily basis. For instance, they have every size plastic bag you can imagine. And these are given away freely by the thousand to unthinking (unaware) people each and every day. I've actually seen the shop staff place a pack of cigarettes into a tiny plastic bag and then watched the customer throw the bag into the trash can on his way out of the shop! In addition, they will automatically place plastic straws and spoons into your shopping bag if it contains things like yogurt. A lot of this non-biodegradable plastic ends up in the oceans only to be mistakenly consumed by wildlife! Is that kind of behavior by these multi-national corps OK with you? I don't use these shops for a lot of stuff and I hand carry the few items I do buy back to my vehicle. If I do use them I always inform the staff that I don't need a bag and I automatically refuse any and all plastic straws and spoons etcetera. The point is that by continuing to accept the way these uncaring corporations operate you are saying, yes that's fine - I'm OK with that. The choice will always be yours. Self Help Motivational Call to Action - Who to Support re Food? 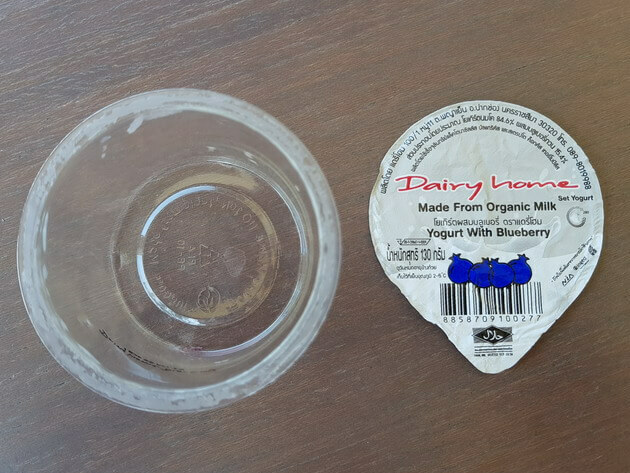 You see, the reason I decided to no longer purchase this brand of yogurt and thus to no longer support this manufacturer is because: every single item from this product, as displayed in in this image, is made from plastic, yes even what looks like a tin foil lid is actually plastic. 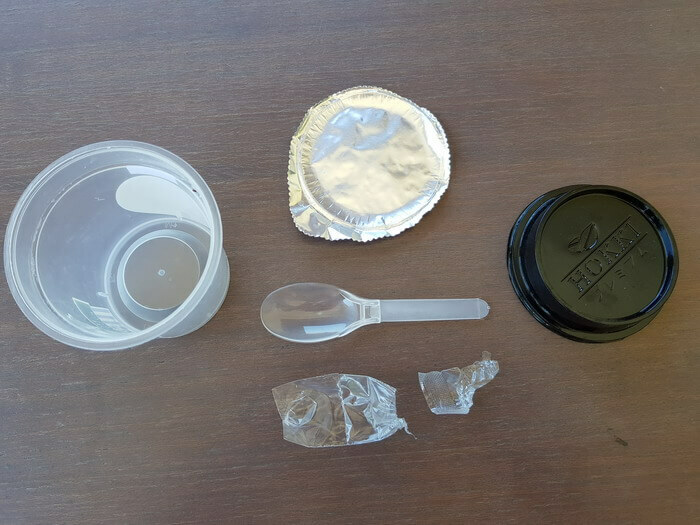 In addition, the inconvenience shops I mentioned earlier will still throw a bunch of plastic spoons in your bag if you're not paying attention. And sadly, at least in Thailand all of this plastic ends up in a landfill or in the ocean! This is the yogurt brand I prefer to purchase. 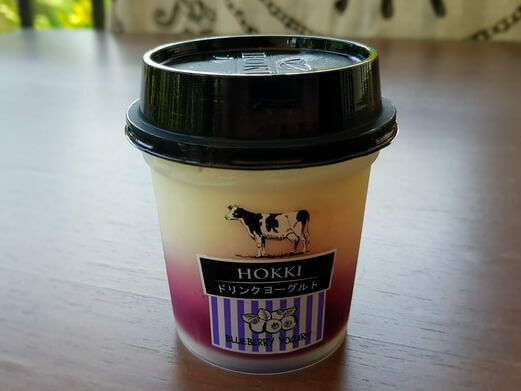 Not only does it taste great, but it's made from organic milk and only costs US$0.80. However, the primary reason that I choose this brand is because only the container is made from plastic. 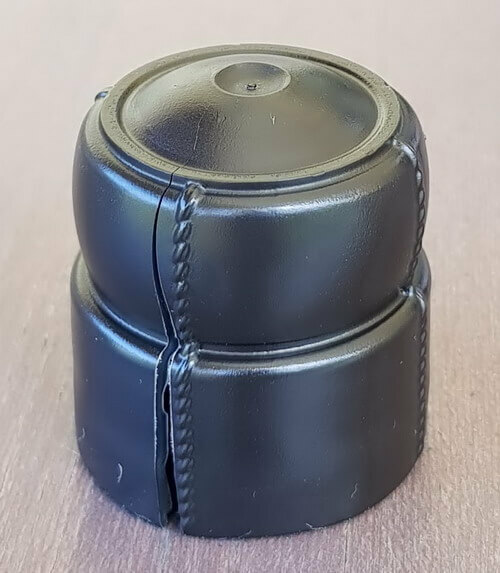 The lid is metal so can easily be recycled. The above example of this self help motivational call to action is concerning a single product. However, in order to shift to the parallel reality idea of earth that you say you prefer, these decisions need to be made concerning everything you consume every day of your life, not only food! Therefore, start thinking about your preferences as you go about your daily life and choose to only support the people, products and companies whose manufacturing processes and ethics fit with your idea of the kind of world you prefer to live in! It's worth remembering that "change" of any reality is impossible, as there's "no-time" in which any change can occur. What we are doing is changing our self, our vibration, and shifting to an already co-existing parallel reflection of reality! Self Help Motivational Call to Action - Who to Support re Glasses? Small flakes peeling off after 12 months of usage. Because I live in the tropics I always invest in purchasing high quality sunglasses. A couple of years ago I bought very nice Oakley Flak Jacket sunglasses for approx. US$300. 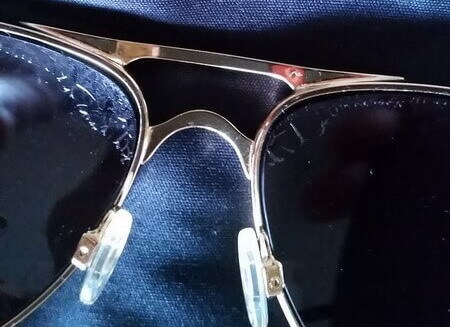 However, once the glasses were around 12 months old small flakes of the lenses started peeling off. At 13 months old the sunglasses were almost unuseable. This self help motivational call to action example shows us how products are designed to fail just after the warranty has expired, which in my view doesn't represent good value, nor does it imply love. 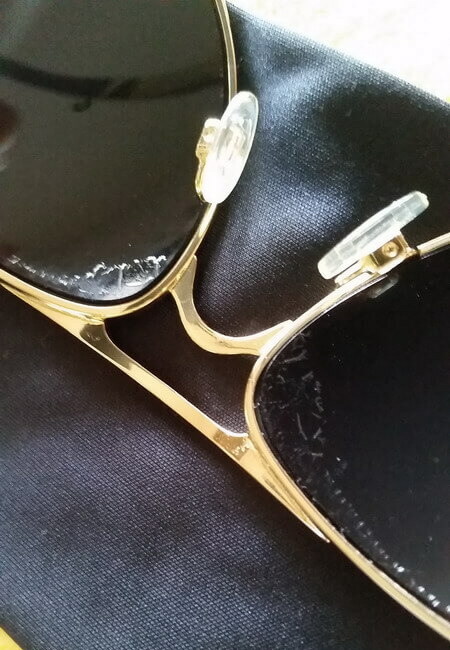 Once the sunglasses were about 13 months old the lens flakes made it increasingly difficult to see from them. After 14 months of useage the sunglasses become useless. And once the sunglasses reached around 14 months old it became impossible to see from them. You can see the lens flaking issue progressing in the images. 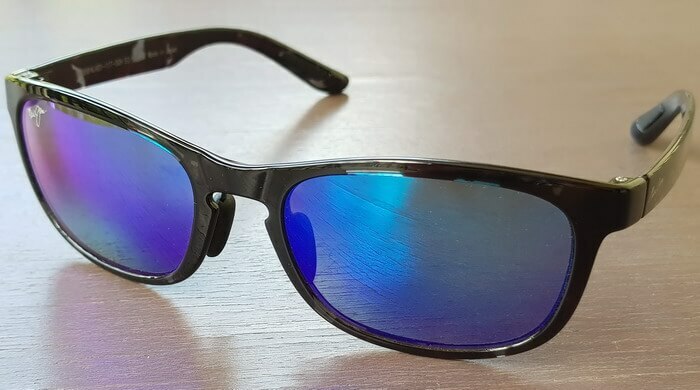 As I was dissatisfied with the short life span of these Oakley sunglasses I returned to the shop where I'd purchased them, but they said sorry the warranty is only valid for 12 months. At that point I contacted Oakley head office in Bangkok, Thailand. Unfortunately, they were very unhelpful and impolite. They finally conceded there was some kind of fault with their products and offered to replace the lenses for US$100. However, I was still unsatisfied with this solution. 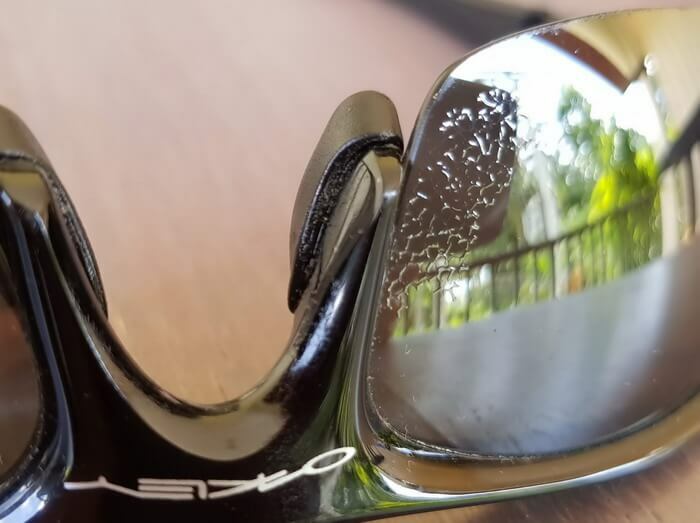 After all, why should I have to pay for an apparent Oakley shortcoming in manufacturing process, be it accidental or intended? Now I was more determined than ever to get some satisfaction. So I decided to write to Oakley head office in California, USA. I had planned to tell them the truth that I’d switched from Ray Ban to Oakley and to ask them if I should now switch back. However, after doing very little research I discovered that both brands are owned by the same Italian company called Luxottica. That’s right; this self help motivational call to action points out that neither Oakley nor Ray Ban are American brands/companies. They are both owned by the world’s largest eye wear company - Luxottica. This company owns around 90% of all prescription glasses and sunglasses brands in the entire world. Any top name you can think of is probably owned by this one huge company! Self Help Motivational Call to Action - Business as Usual? To continue, as this was not the first time this issue had happened I decided to write to Oakley California about it. 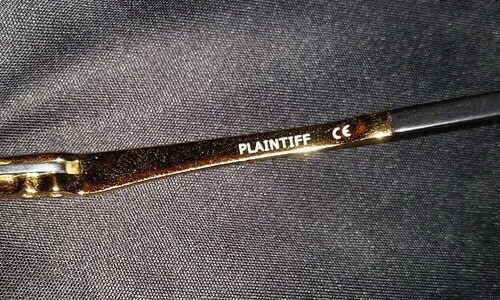 I told them about another model called plaintiff, that I'd previously owned, which also suffered from lens flaking after 13 months. 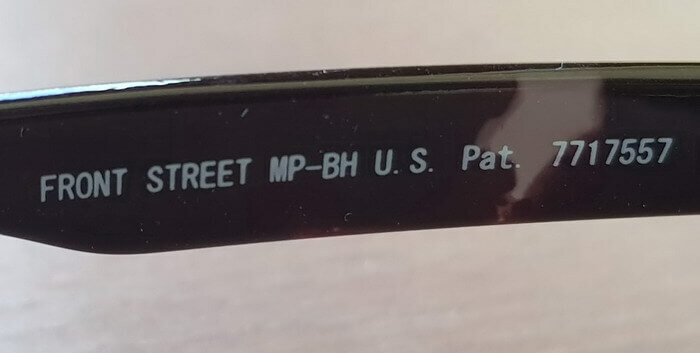 In fairness, California office were very friendly and actually sent me two pairs of Oakley sunglasses as replacements, both the Flak Jacket which were brand new and a pair of Plaintiff which I think, due to the frame being twisted, were factory rejects. Still, better than nothing I thought at the time. At that point I was happy with the outcome of my complaint and the time I'd spent on the issue, and thus had decided to continue buying Oakley. However, wait for it... At 13 months old, once again, the lens started flaking on both of the sunglasses I’d been sent as replacements for, er… hmm... lens flaking. In that instant I decided not to support this business practice anymore, so will no longer buy products from any brand owned by Luxottica! And this self help motivational call to action urges you to do the same regarding any product you are dissatisfied with. These corporations must either step up their game or disappear into obscurity. But this will only happen if you do your part of not supporting the rotten tomatoes! Self Help Motivational Call to Action - Companies I Do Support! I realize that what's been said so far can be perceived as slightly negative. Therefore, to counterbalance that and to break up the page a bit, below is a list of companies that I'm totally happy with and thus then, will continue to support. This list consists of products that I personally purchased "brand new" and so have been the first owner. That is to say, I'm not including any products I purchased "used" even if I was satisfied with them. Phones, TVs, Stereo, Notebook, Monitor, SSD etc. Used for 5 years, no issues! Never faulty, lasts for years! Used for 3 years without issue! Used for many years without issues! Used for 7 years without an issue! Used for 2 years, no issue so far! Not a single CPU failure in 25 years! Excellent high tech, few issues! Self Help Motivational Call to Action - Who Do I Support re Glasses? Now, I realized that as most brands are owned by one company aka a monopoly, there are not very many independent manufacturers left. However, after doing some research I discovered Maui Jim. Although it was a bit of an effort and time consuming finding this brand in Thailand I went out of my way to do so! And I'm very happy with the Front Street model I found and purchased from a department store in Bangkok! The advice of this self help motivational call to action is very clear: do not support manufacturers who do not meet the standards and ethics you prefer - even if it means you have to go out of your way! Self Help Motivational Call to Action - Companies I Don't Support! Like most large corporations Nestlé doesn't care about you it only cares about its own bottom line aka profit! And if this means that the products they sell are detrimental to your health, so be it! I stopped buying all Nestlé products around 2007. Whenever possible I absolutely refuse to purchase anything from the world's biggest food corporation. And perhaps after reading this self help motivational call to action you will choose to do the same. The highlight below is the actual statement made by Nestlé CEO Peter Brabeck-Letmathe. "There are two different opinions on the matter. The one opinion, which I think is extreme, is represented by the NGOs, who bang on about declaring water a public right." Brabeck elaborated on this "extreme" view: "That means that as a human being you should have a right to water." That is to say, Nestlé don't believe that free water is a natural human right. They state that it's an extreme view to believe that every human on the planet can have access to clean and free water. Instead they support the idea that ALL water should be controlled by corporations and sold to us at a profit, regardless of whether all people can afford to pay those corporations. And that's just one reason why people hate Nestlé. Watch this 1 1/2 minute video to help you to make an informed decision. Sometimes it's sad that I have to refrain from using a product in order to continue along my path of shifting to a preferred parallel reality experience. For instance, once I discovered that Nestlé had acquired both Perrier water and S. Pellegrino sparkling mineral water I stopped buying those products too. You see, this kind of negative business empire does not exist in the parallel reality that I'm shifting to! Please remember that due to the LOA (law of attraction) - what you put out (vibrationally) is what gets reflected back to you as your reality. Thus, if I continue to focus upon and support what I don't prefer, then the only possible outcome is more of the same! There's always an alternative, so now I buy San Benedetto sparkling mineral water instead of the two brands mentioned above. Besides, can you really afford not to boycott everything Nestlé? Self Help Motivational Call to Action - a Word on Monopolies! One possible ending to the semi-fictional story I'm about to tell should be quite evident to most people as it's not rocket science. Let's talk about one corporation in Thailand and what could ultimately happen if we collectively continue to support monopolies instead of encouraging diversity. To be clear: I mean I'm in favor of 100 different kinds of shops, rather than 100 branches of the same shop. Several years ago, around 2004, a British food corporation called Tesco entered the Thai market. They began opening hyper-stores and trading as Lotus. In those days Tesco was written in small letters and Lotus (the Thai partner) in very large letters. Over the years the letter sizes have become the same size so it's now Tesco-Lotus (TL). Around the same time 7-11 and Family Mart shops began opening all over Thailand. At the time this corporation opened its branches there was a mom and pop shop on every corner, albeit they were typically quite dirty. In addition to offering lower prices TL also offered cleanliness. At this stage everything seemed fine. I guess the mom and pop shops were feeling the pinch, but the general public seemed quite happy. However, once TL had established hyper-stores in every province in Thailand it began to open smaller stores called Tesco-Lotus Express on every corner that wasn't already occupied by a 7-11 or Family Mart shop. That is to say, not only did TL directly compete with every mom and pop shop, but it also began competing with the other main competition too! Fast forward 10 years from now to 2028 and most of the mom and pop shops have closed because they can't compete with TL prices. And TL Express shops now outnumber 7-11 and Family Mart shops combined. Nearly anything you want to buy is only available at TL. And as they have the monopoly on 90% of everything, they dictate what price you will pay for anything you need! This is the danger of supporting a monopoly instead of encouraging diversity! The solution is to support your local community. So what if it costs a bit more money? As long as you believe you'll always have more than enough money and abundance, then you will 100% guaranteed! Self Help Motivational Call to Action - Borderline Companies! This company produces a lot of wine. I like these small bottles of sparkling wine as you get approximately 2 glasses, which is a good amount to enjoy with a meal. As you can see the bottles looks nice and the packaging is attractive. I'm on the verge of totally discontinuing my support of this company, due to this blatant act of waste and pollution. If anyone from Jacobs Creek reads this, please relay this message to head office. 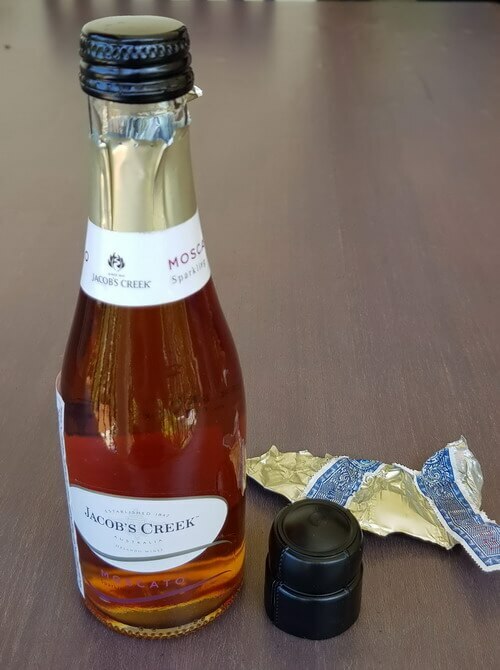 We don't care about fancy packaging or making this look like a champagne bottle. We care about quality and taste! Well friends - that's all I wanted to say on this Reality Change page. Through this self help motivational call to action I have laid the framework of what's necessary in terms of the kind of thought and action necessary in order for you to shift to a preferred reality. It’s really simply a matter of changing your vibration to match the vibration of the reality you now prefer to experience. However, and I can't emphasize this enough, although you do create your own experience of reality, the reality itself already exists "as" a co-existing parallel reality reflection of the multi-dimensional crystal of All That Is. That is to say, the simultaneity of existence is all inclusive; so Everything That Is, by definition, already exists, thus it’s not that you actually have to create anything. In conclusion, this self help motivational call to action states, affirms and confirms that it's up to you 100%. You have free will and thus it will always be your choice of whether you want to change yourself by changing your awareness or not. To do so means making more informed decisions about everything you consume: be it food, drink, television or news etcetera. What are your product experiences? Do you have any product stories to add? What experiences have you had with products? Feel free to share your good and bad stories here. You can even list companies with a brief explanation and I'll format for you. Please Share Here!